The Village of Ephraim Streetscape Project is a multi-faceted project in downtown Ephraim including underground utility burial from our Wetland Preserve North to German Rd, new decorative streetlights from Brookside Ln to Anderson Dock, and a reconstruction project of State Highway 42 from our Village Beach north to the Firehouse Marina which is scheduled to begin in March of 2019 and finish by the end of June 2019. The reconstruction portion of this project will result in a full closure and detour of Highway 42 from March 18, 2019 to May 24, 2019. To accommodate summer tourist traffic the second phase of the project (May 25, 2019 to the end of June 2019) will see construction continue however Hwy 42 will be reopened under flagging operations. While construction is well underway and your usual route through our little village may be temporarily disrupted its important to know that Ephraim is still open for business. Our Ephraim Business Council has put together a map of alternate routes you can use to visit your favorite shop. Up until yesterday’s snow and rain our contractors have been fortunate to have some great weather and working conditions. That good fortune has resulted in great progress and has us well within schedule, to the point that all storm sewer work should be completed next week. Storm sewer work next week will be occurring between Hidden Spring Rd and German Rd. Once this is complete the crew from Peters will begin removing the balance of the existing asphalt in our reconstruction area in preparation for grading. Those of you who reside in or visited a destination in the reconstruction area this past week may have noticed it appears a little darker at night than you may be accustomed to. In preparation for our new streetlight project which runs along the highway from Brookside Ln to Anderson Ln existing lights have been de-energized and will be removed next week. Upon completion of this task the crew from Northern Electric will start running electrical conduit beginning at Anderson Ln and working south. The sanitary manhole project has been completed, and if Frontier Communications completes their work as scheduled the utility poles from the Wetland Preserve to German Rd should be coming down the week of the 29th. Two weeks are in the book and the crew from Peters has completed storm sewer outfall work at County Q, Harborside Park, and South of the Firehouse Dock. They also have completed inlet construction on Moravia Street for future buildout up the hill, and installed structures at the Moravia/42 intersection that will collect surface water that currently flows onto 42 from Moravia. Additionally the storm sewer trunk line has been extended south to German Rd which also received much needed infrastructure replacement. Storm sewer work the week of April 1st will continue from German Rd South towards Hidden Spring Rd. Properties within this area will find easier access from the South to begin the week but as the crew continues South some will find access easier from the North as the week progresses. Next week we will begin the task of de-energizing our existing streetlights in the replacement area in preparation for their removal which is scheduled to begin on April 8th. The sanitary manhole crew is about half way done with their work and will progress in the Southern area of the Village next week. Work areas will be protected with additional signage and safety barrels in and around the manholes. The area from the Village Hall North to Orchard Road, where sanitary work occurred this week, is complete and barrels should be removed from the traveled roadway later today. Beginning Wednesday, March 27, 2019 work will begin on repairs to the sanitary sewer manholes in the North Bound Lane of HWY 42. This work will begin in the North end of the village near the 42/Orchard intersection and work South through the village. The repair will result in traffic impacts, flagging operations, one lane roads, and traffic barrels protecting the new manholes. Cure time for the rings and risers is three days so expect to see construction impacts in these areas for the rest of the week in the North end and most of next week in the central and Southern portions of the village. Barrels and barricades will be affixed with flashing beacons but all should be aware and cautious when navigating these areas in the next week. With respect to the ongoing storm sewer work a decision was made to continue working from Moravia Street South towards German Road for the rest of the week. Those needing access to businesses or properties in the reconstruction area this week are requested to come in from the South not the North as previously planned. Updates for next week’s storm sewer work and navigation will come Monday morning. The first full week of Streetscape Road Reconstruction is in the books and we are making good progress. New concrete storm sewer outfalls to the bay with new culverts under the highway were installed at the intersection of Church and Hwy 42, at Harborside Park, and at Moravia Point South of the Marina. This is the first of several weeks of storm sewer infrastructure work that will be kicking this project off. The construction crew was also busy at the end of last week removing those trees necessary to make room for the new sidewalk and storm sewer inlets between German Rd and the public beach. The construction team has been very open and transparent and we have already established a solid system of communication between staff, our construction engineers, and our contractors. For the most part local traffic has done well to avoid our construction area but there certainly are still many driving around barricades and thru our closed road. The sheriff’s department has and will continue to have an increased presence in the village to keep motorists and workers safe. Today (3/25/2019) work will continue in the area of the South Moravia/ Hwy 42 intersection. This work will make this intersection impassible to all traffic. 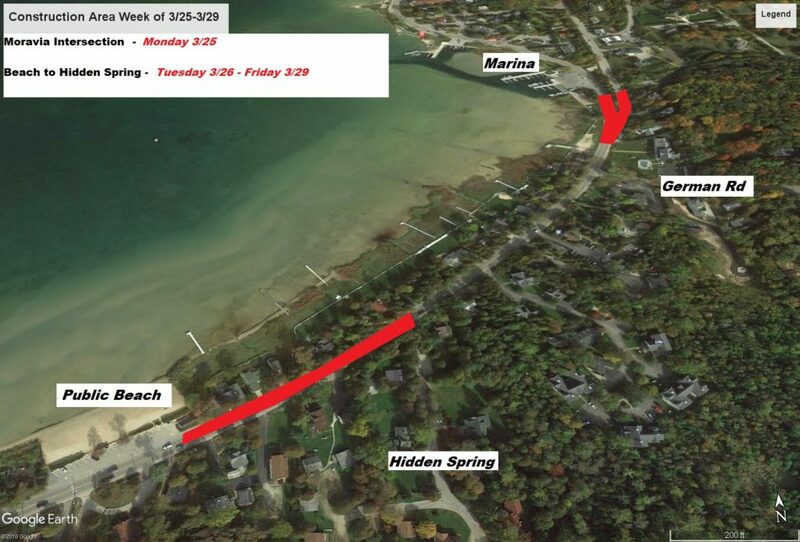 Beginning tomorrow (3/26/2019) storm sewer work will move to the area of the public beach to Hidden Spring Rd. Those needing access to homes and businesses in the construction area this at this time will need to approach from the North. As many of you have seen, digital message board signs are up at the north and south ends of our project detour informing traffic using Hwy 42 of the pending road closure that will go into effect on Monday, March 18th. As the construction teams begin to mobilize for construction more and more preparations will be visible. Our road crews have done what they can this past week to increase visiblilty at intersections and increase road widths by pushing back mountains of snow. With many likely to use the network of side streets in Ephraim and neighboring communities to get around during construction the Village and County Emergency Service staff stress to all to be safe out there. Again, the Village is asking that residents and business owners inform delivery vehicles and contractors to follow the detour route and to stay off of our side streets to the best of their ability. No thru truck traffic signs will be placed on many of our side streets and the Door County Sherriff's department has been asked to help monitor traffic and speed in the interest of safety. Once construction begins weekly meetings will be held providing updates on progress made and work to come over the next days. Updates will be provided on this page, send out via email, and distributed to media outlets to the best of our ability. A preconstruction meeting was held on Friday, March 1st with Ephraim village officials, engineers and the construction team. A date of construction was set for March 18th at which time Highway 42 in Southern Ephraim will be closed to thru traffic and the approved WisDOT detour will go into effect. As noted in recent project updates those needing to access homes and businesses in the hard closure area will be provided access to these locations but delays should be expected. Additional signage will be placed at County Q and Hwy 57 directing those using the detour to Ephraim and Ephraim businesses via Q. When looking at our construction page and official detour on the Village webpage it is easy to assume that many with local knowledge are likely to use the network of side streets in Ephraim and neighboring communities to get around during construction. In an effort to provide for safe travel during this time the Village is asking that residents and business owners inform delivery vehicles and contractors to follow the detour route and to stay off of our side streets to the best of their ability. The significant snow fall this winter has resulted in limited visibility at intersections and narrow road widths. Village crews will be working to remove much of this snow in the coming weeks and no thru truck traffic signs will be placed to preemptively combat this concern. Additionally an increased presence from the Door County Sherriff's department has been requested during this time. State Highway 42 will be seeing additional roadway construction independant from the Village's project that will also begin in the spring of 2019. WisDOT is currently planning a resurfacing project of Hwy 42 from the town of Gibraltar to the Village of Sister Bay that is, at this time, scheduled for a spring 2019 start. 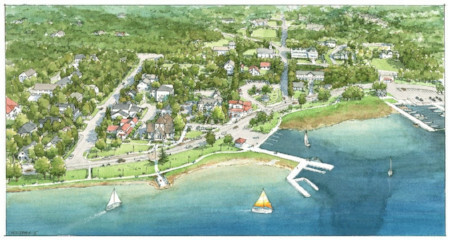 Project details are still tentative as the project is currently in the process of being re-bid but is likely to impact Northern Door County traffic in the spring of 2019, Fall of 2019, and Spring of 2020. More information regarding this project can be found on the WisDOT project website below.